I woke up to my alarm at 5:15am. I continued to lie in bed refusing to acknowledge the light hearted tones coming from my cellphone, as I hoped that it was just part of dream that would somehow disappear. The sound of the alarm for which I had developed a small hatred, continued to grow more and more loud. I gave in. As I sat up and fumbled to unlock and turn off my phone, the feeling of dismay started to chime in; It’s a work holiday, I have to wake up at this unreasonable hour, and I have to go run a race in the heat of July with 60,000+ people… There could not have been a worse decision to make. I’m never doing this again. Coffee, oatmeal, water, clothes; it was all a repetitive blur. I combined some light stretching with the coordinated efforts of pinning the race bib on my shirt, and tried to go through all of the items I needed to take with me. 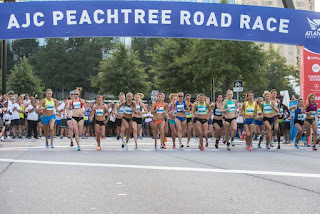 Kimberly and I had previously planned to take Marta (The Atlanta train transportation system), as it is about the only way to get to the race. I had my “Breeze card” with a few passes left, but we had to pick a new card up for Kimberly, so we needed to get there early. We parked at the Avondale Marta station at about 6:15am, and since our race waves both started at about 7:30am, we were making good time. It wasn’t long after we got down to the deck when the train arrived and we were luckily enough to catch the door right where we were standing, and quickly made our way to a seat. Sitting down, we watched the people pile in. Every single person had on their race bibs, and we enjoyed trying to pick out the earliest wave, and for a long time, I was winning with wave B! 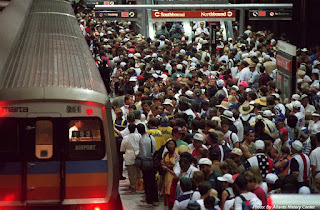 We arrived at the Five Points station in Atlanta, the transfer station, and had to get off and move to the northbound redline train. We immediately discovered that this was going to be a challenge. There were so many people. When the train arrived, we tried to stay calm and move our way in. I overheard several people grumbling the phrase “packing in like sardines,” but in reality it was much more like a human canned cranberry sauce! There was no longer the existence of several people on these trains, it was just one giant mush of arms and leggs. Each person contorted to have at least one hand on a railing or seat or ceiling, which would also cause the rest of their body to be flat against the people next to them. I tried to focus on touching as few people as possible, to help distract me from all of my other offended senses. 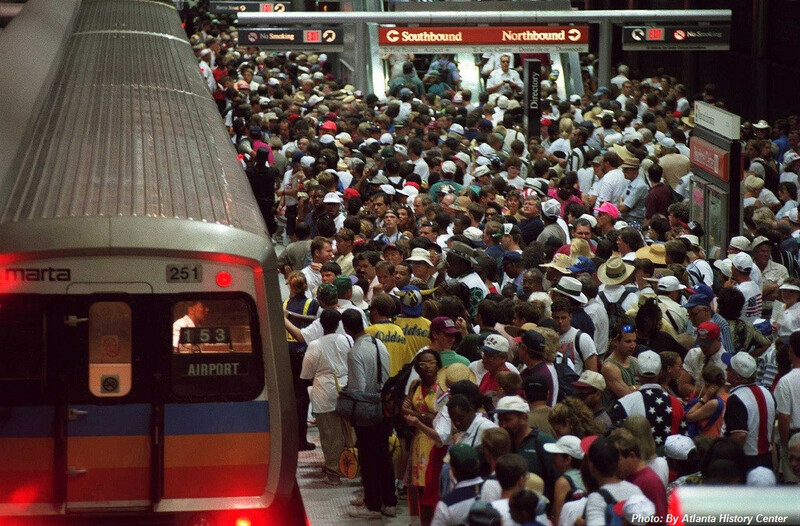 The humidity of the Atlanta air was further drowned in the warmth and moisture created by every person breathing in the tin box of a train car; If I could see to the nearest window, I’m sure that it would have been completely fogged over. Finally, the train began to chug along. The minutes lasted so long, but at least we were moving. Soon, I knew we had to be close to our stop, and then suddenly, like something out of 90’s teen comedy, we jolted to a screeching stop. Having arrived late to races in the past, I am somewhat experienced at stretching while on the run to the start line. Merging in with the other 60,000 people, I worked to turn my cellphone to Spotify and start my music, and then to alert Strava that my run was about to begin. Just as I strapped on my phone’s armband, I was pushed forward by all those around me and we were across the starting line. While my natural adrenaline began to kick in, I found myself tip-toeing forward like a ballet dance, trying not to step on all of the people in front of me. One toe forward, one to the right. One toe further to the right, one forward. It continued like this for at least the first full mile before I was able to take a half-step in any direction. I waited for my opportunity to sprint forward and release the anguish I was feeling of having to navigate person after person, and being held back against my will. This luxury never came. As the mile markers passed, I was always aware of exactly how much further I had left to hit the finish line. 1 mile in, I’m sure that by mile 2 I will be able to sprint forward. Mile 2: I think that I see a straightaway on the left. Mile 3: There must be 50 people stopped at the upcoming water station, I can get free after that! At about mile 5, the 90 degree heat combined with the thousands of people around me, gave way, and forced me to a stop at the last water station. I realized then, that I was not going to be able to run. In that moment, I was angry, frustrated, tired, and then, possibly relieved. I looked around, and for almost the first time, I actually saw the happy, light-hearted, holiday event that was in front of me. I spent the last mile doing my best to run, but aware of the goings on around me. As I crossed the finish line, I smiled for the cameras, and somewhat understood why I was here. But now, I need water! Due mainly in part to the stifled congestion that I was forced into, I did not enjoy the race; But from the perspective of those who don’t plan for an all out haul to the finish line, I can see the appeal. I describe now from my peripheral vision, obtained from the corners of my eyes while looking for spots to slide past the next person in front of me during the race. 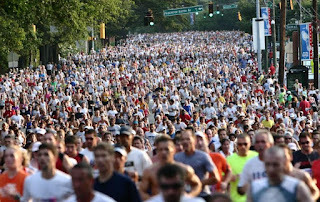 Had I decided to go for a light jog and enjoy the race, I would have acknowledged the hundreds to thousands of people who lined the sidewalks as well. Starting at the very beginning of the race, there were cheers of motivation, entertaining posters, costumes, and much more. Every 5 feet that I passed, there would be more people offering high fives, pizza slices, and even beer! While there was water provided at every mile passed, there were also jolly bystanders happy to provide everything from snacks to bloody marys. I counted at least a couple of bands set up with speakers, amplifiers, and intoxicated dancers. While heat is always a major issue on the 4th, there were a few opened fire hydrants along the way to which you could stand in or just run by to get a nice shower. The craziness was not limited to the bystanders either; Racers were often found in full costume or body paint. Many wore the red, white, and blue, but others represented their own interesting attire. I saw everything from hotdog costumes, cross dressed clowns, and 2 man horses, to people fully covered in gold paint, superhero costumes, and people only wearing underwear. 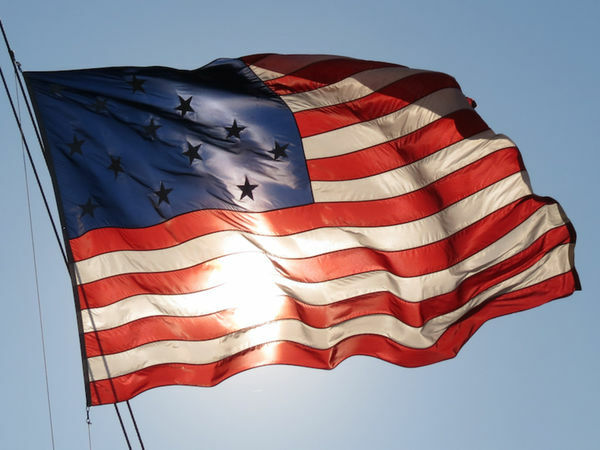 Several fireman, soldiers, and policeman in full uniform carried the American flag, and reminded us all of why we were there to begin with, and what we were celebrating that day. It’s really amazing to step back and think about what was taking place: People gathering for a large event, despite the difficulty that it causes. People running as fast as they can to finish, and those who walk just to enjoy the scenery. People from every state (except for 3 this year), and from dozens of countries. 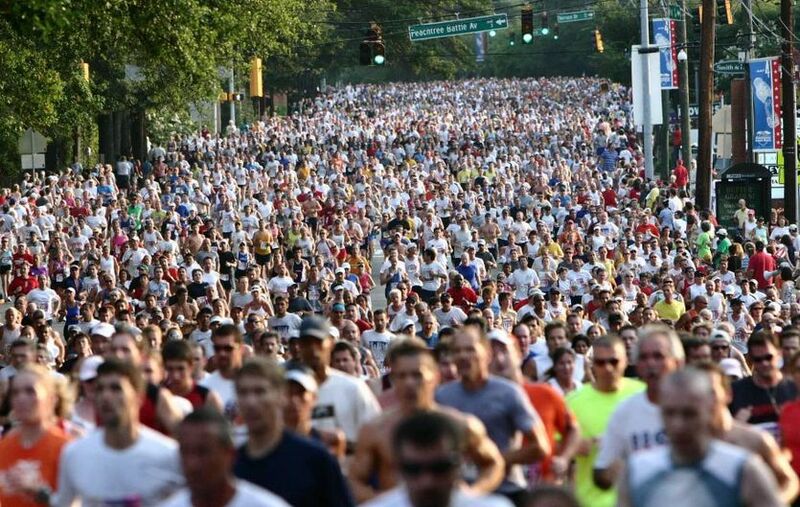 All of these people coming together in Atlanta, to appreciate our country, and celebrate with others. 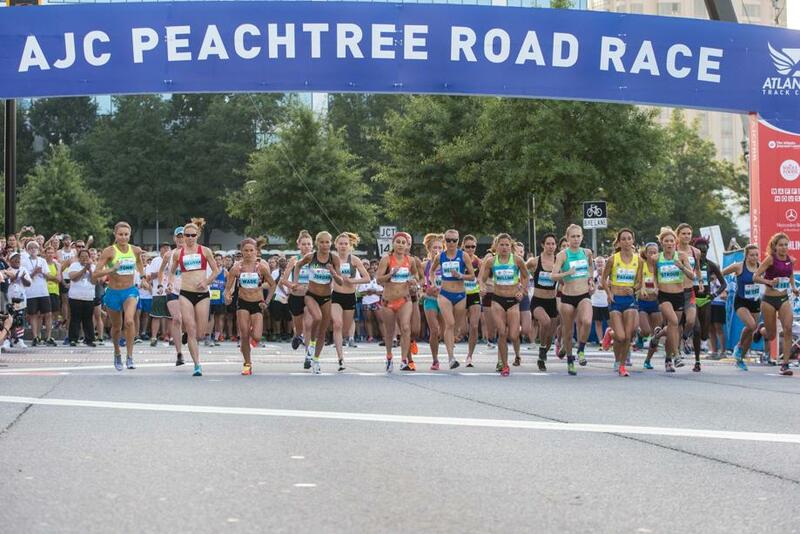 In the politically challenging year that we have had, the Peachtree Road Race was a great reminder that there are still good people here, with similar values, that care about and are willing to support each other.